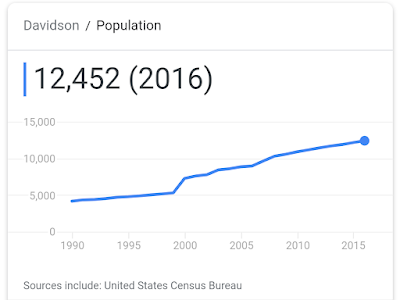 Recent stories on population growth in the Charlotte area conspicuously did not mention Davidson as one of the top areas for new residents. (See here as an example.) That may be surprising considering the number of new developments in the works around town. 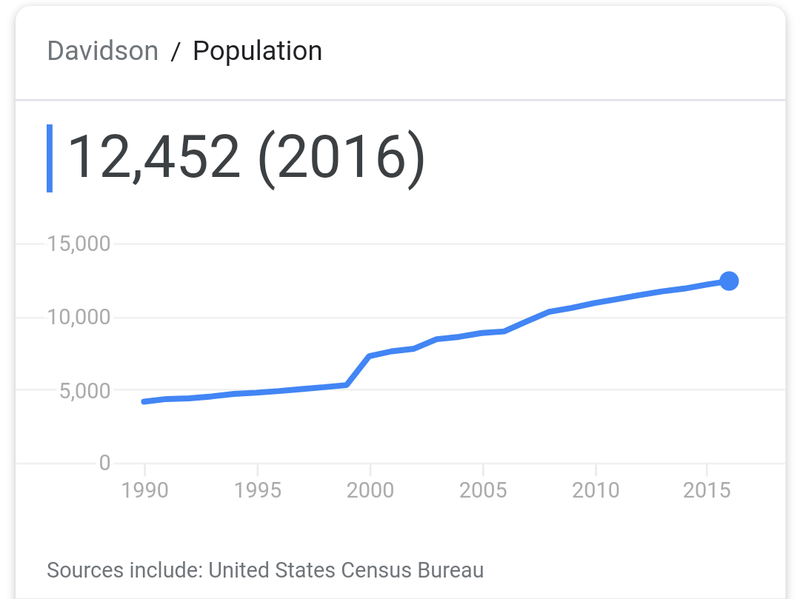 As the below graph shows, the town's population has been growing at roughly the same rate over the past few years - consistently adding about 250 people per year from 2010- 2016. According to the Census bureau website, the July 1 estimate for 2017 says 12,684 continuing that trend and adding 232 people. However, new developments set to fully come online this year should see that number accelerate quite significantly. 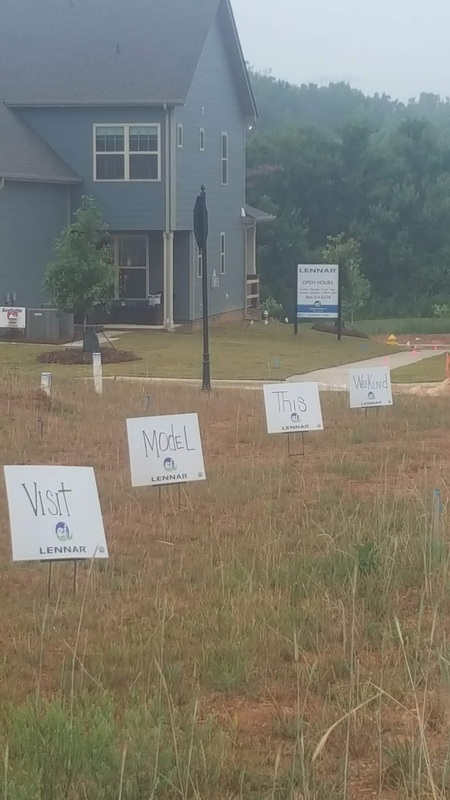 Two developments in particular will drive this accelerated growth - Davidson East and WestBranch, both under construction by Lennar. The first phase of Davidson East is platted for 249 homes with roughly two dozen already underway. WestBranch is also about to begin selling with its model home set to open this weekend. This development will have 305 homes when completed. Simple math shows how this will impact the growth numbers for the town. 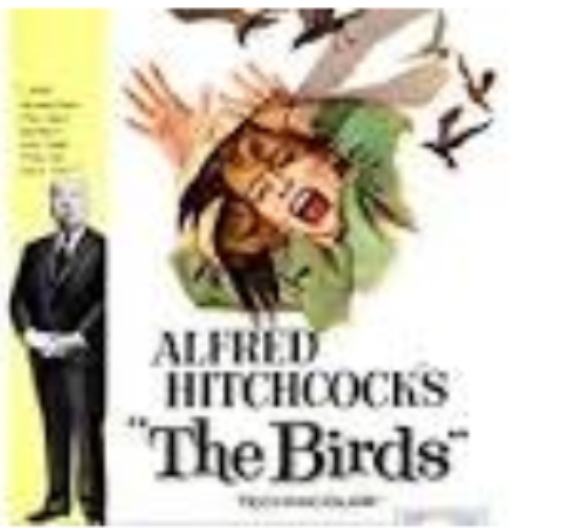 If over the next 3.5 years these two developments build out at an average of 158 homes per year and these homes are populated at the town average per the US Census of 2.59 people per home, then just these two developments will add something in the neighborhood of 410 people per year. The numbers could be less if the buildout is slower, but it could be more if the average per house is higher. This is likely in addition to the 200+ annual average that has been added to the town population in recent years. This doesn't count other new neighborhoods also underway like Washam Neighborhood, Davidson Bay Phase II, and Narrow Passage plus the ongoing infill development that seems to be happening on every vacant lot in town. 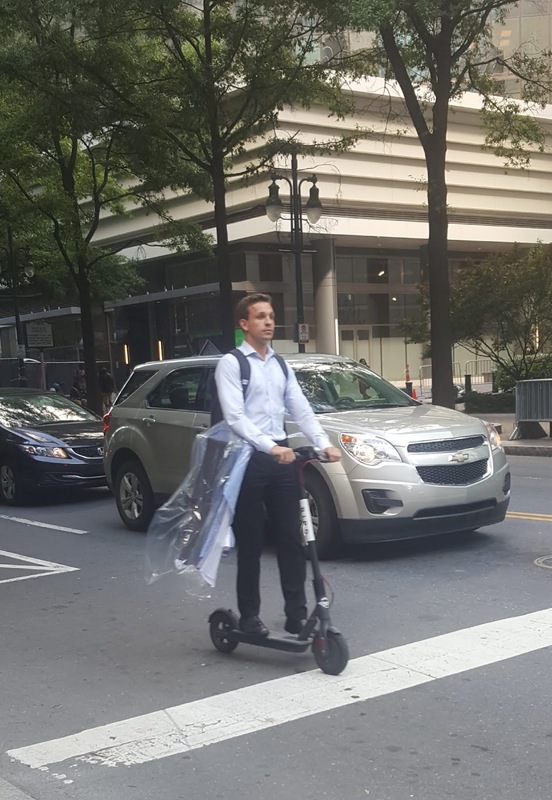 Is Davidson ready to absorb 600-700 new residents per year? We are about to find out. Also, when those growth rate stories come out in future years don't be surprised to see Davidson near the top of the list. 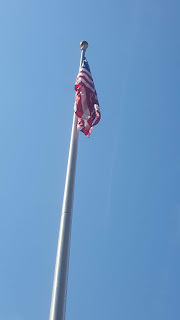 DAVIDSON, NC -- Citizens are invited to celebrate our nation's independence by strolling from McEver Field to the town green for the Concert on the Green on Wednesday, July 4. The stroll will include a color guard, fire engine, and lots of patriotic residents. Participants are asked to line up at McEver Field on South Street at 5:15 p.m., and the festivities will begin at 5:30 p.m. All citizens are encouraged to dress in Independence Day attire and to decorate their wagons, bicycles, tricycles, and pets in red, white, and blue. A color guard comprised of members of the police and fire departments will lead the parade up South Street onto Main Street and the town green. "This is a fun way for our entire community to come together and show our Davidson spirit," said Economic Development Manager Kim Fleming. The concert begins at 6:00 p.m. and features Radiojacks, a top 40 variety band. "We hope to see neighbors from all over the community -- from the Circles at 30 all the way to the extra-territorial jurisdiction -- in the parade and on the green to hear some fun music," said Fleming. 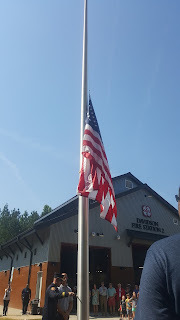 For more information on our Fourth of July activities, please visit www.townofdavidson.org/4th or contact Kim Fleming at 704-940-9622 or kfleming@townofdavidson.org. 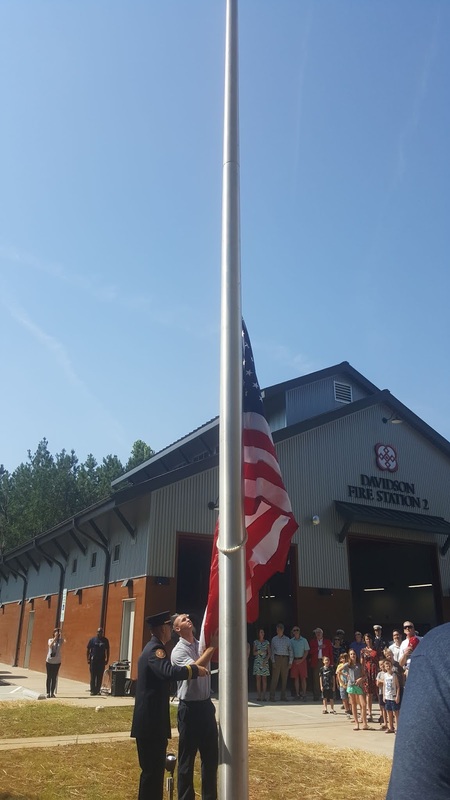 The Davidson Police Department reminds citizens to keep their own safety and that of their neighbors in mind this holiday -- per the North Carolina General Statute, fireworks are strictly prohibited for personal use. aShortChronicle previously told readers about efforts underway to restore the Lingle Hut at the Reeves Temple AME Zion Church on Watson Street. The "Hut" is an historic structure that has fallen into disrepair and needs some significant restoration. The building had previously served as a fellowship hall and meeting space for the church in the heart of the Westside community. The effort is being spearheaded by Kurt and Maria Naas of Cornelius. Like all endeavors of this kind, this one requires money. To date, roughly $8,000 has been raised, but more is needed. On Thursday July 5th at 6:30pm there will be a fundraising strategy/brainstorming session at the Davidson library. If you are interested in joining this effort, please plan on attending. The previous post showed the 10,000 ft view if how to get the proposed public facilities plan down to a passable number. Now, here are some specifics based on the detailed estimate put together by Edifice, the construction engineering firm for the project. 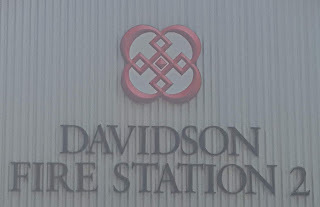 This detail was obtained by Save Davidson and posted to the group's website. You can find it here. 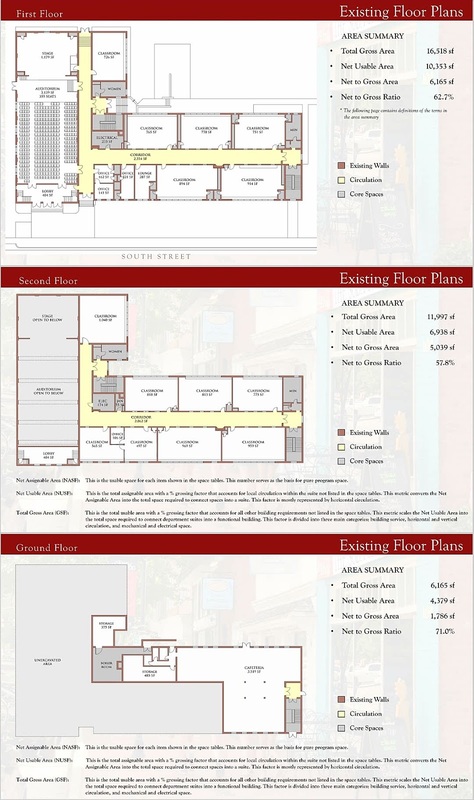 The first thing you will notice in the estimate is that many of the line items for the proposed IB School renovation are based on the overall square footage of the project which comes in just over 34,000 square feet. The costs are peanut buttered across all square feet, but in reality not all square footage is created equal. Some of it is not needed at all. 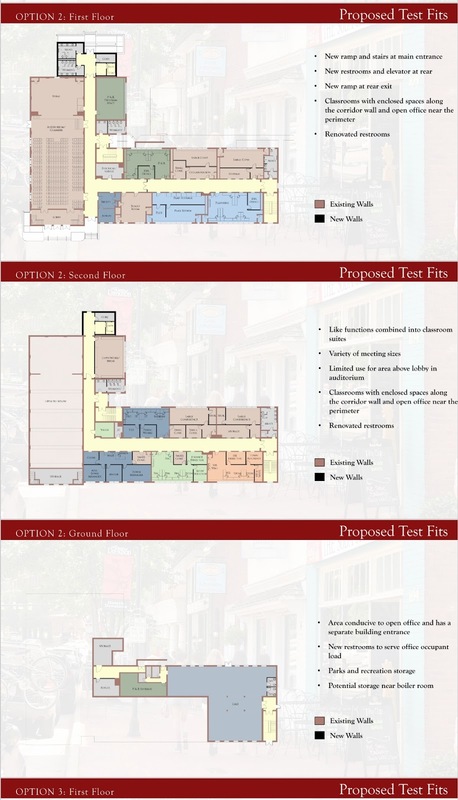 Take a look at the proposed drawings of the IB Building. Ths first show square feet per room. 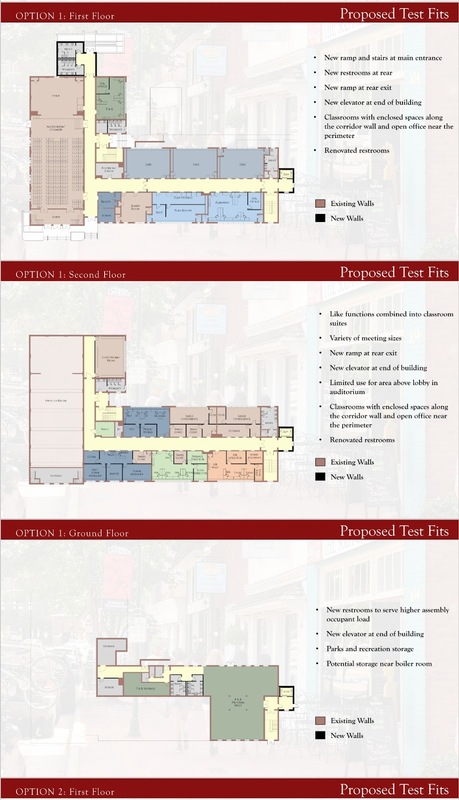 The next three show proposed options for using the space. 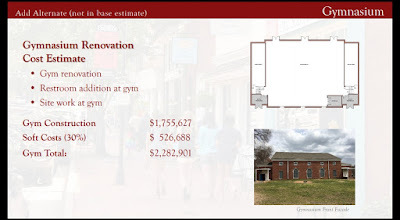 What the above numbers tell you is that the cost to the Town for the Town Hall renovation could be reduced 20-30% for at least the items internal to the building that are peanut buttered across the project. This would depend on which option was chosen and having CMS pay for its portion of the cost. 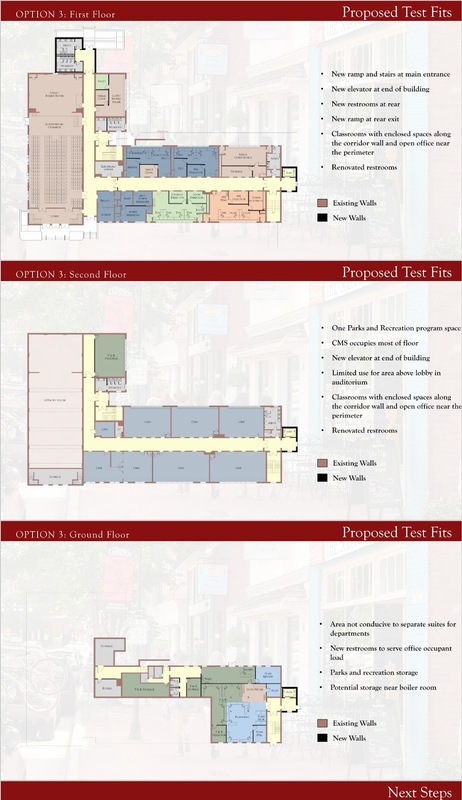 If Option 1 or 2 is chosen, the Town needs to reduce the amount of conference/general purpose space that is renovated. The amount of this space seems excessive for the number of Town employees. Keep a couple of the classrooms as actual classrooms for something like Davidson Learns would be an interesting use and pay homage to the history of the building itself. Sell the location used for Davidson Community Players and use the money to refurbish the auditorium/stage area. Have DCP pay rent as they do today. Cutting these costs is doable, but no matter how much it is cut, the project will still be expensive for a facility the Town won't own. To address that, there needs to be an irrevocable right to purchase the property from CMS at some point. This should be formulated to be something like a sales price equal to market value minus any lease hold improvements the Town has made. Another option would be to have the Town be reimbursed for the lease hold improvements based on the depreciated value of those imprpvements if CMS ever has the Town leave the facility. With some creativity, the Town could get this done. However, they must get the cost down significantly, and they must remove the risk to the taxpayers. Without doing those things bond funding will have a hard time passing voter muster. How to get the $16.1 million public facilities plan down to less than a $10 million bond. On Tuesday Davidson Commissioners got their first public glimpse of the proposal to convert the old CMS IB Middle School into municipal and CMS offices. 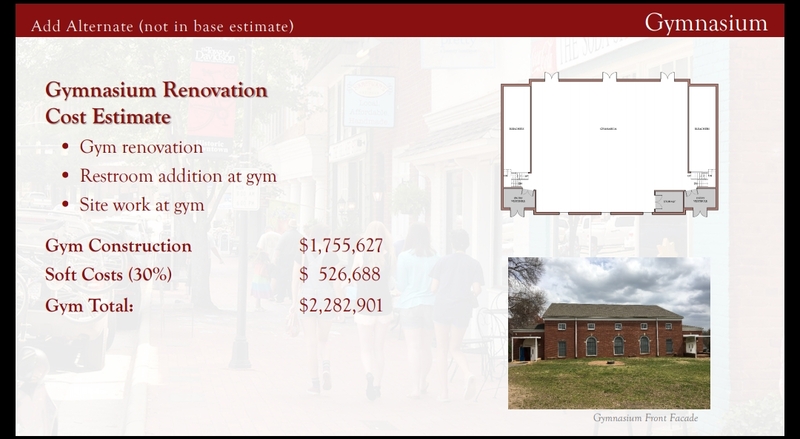 Coming in at $16.1 million the plan is significantly more expensive than many expected, particularly for a Town Hall facility the Town won't even own and for a plan that doesn't even include rehabbing the old gym on the property which was the most intriguing part of considering the site. Importantly, since the Town won't own the facilities getting funding outside of General Obligation bonds may be all but impossible. Finance Director Piet Swart didn't use the word impossible, but he did indicate finding a "dance partner" for a private loan would be very difficult and that it would likely be a shorter term loan making the payments higher. So, if the Town wants to pursue a plan with public input and support, it needs a bond package that can actually pass voter scrutiny. To achieve that, the price tag has to come down...way down. In the opinion of aShortChronicle that would mean something no more than $10 million total. How could that be done? Well it is going to require discipline, creativity, and putting a hold on instant gratification. It can be done, but requires hard choices. Here is one possible approach based on the 20 year plan numbers from the presentation last Tuesday. First of all start with the assumption of a plan that could pass voter muster with the goal being no more than $10 million of bond debt. That however doesn't necessarily mean only $10 million in total spending. 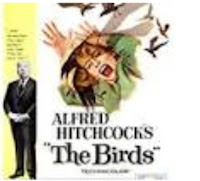 Second, split the bond into two separate votes. The first bond is for public safety facilities, the second is for a new Town Hall. The needed public safety facilities should not be lumped with the Town Hall and then used as leverage with voters to pass the bonds. One sure fire way to generate opposition to a bond package is to inappropriately use public safety needs this way. Third, pay $2 million of the $3.87 million cost of the Public Safety facilities out of the Town's unassigned fund balance. The town has at least this much above a the target of 35% of annual general fund expenses. That means this bond would be at most $1.87 million leaving $8.13 million under a self imposed $10 million bond cap. Fourth, take a hard look at the $3.65 million in "soft costs" that are a part of this estimate. Soft costs cover things like furniture, decorations, plants, etc as well as contingency for cost overruns. Instead of the 30% "standard" used by the construction engineer, cap these at $1 million out of the bonds. The construction engineering firm claimed a very strong track record avoiding cost overruns at the presentation on Tuesday. If that checks out, then don't put these in the bond package. Instead, plan on taking these out of fund balance if needed. This will require discipline on the part of the Town to not spend fund balance on other things until this project is completed. However, the whole point of fund balance is to cover unexpected events, so counting on it for unexpected cost overruns seems appropriate. Steps 1-4 are the easy ones that can get the total down to $13,447,912. From here it gets harder. Fifth, find 10% savings in the construction costs across the two projects for total of $1,182,691. This may require leaving some things for later, but cutting 10% should be feasible. This brings the public safety bond down to just at $1.5 million by lopping off $387k from that project and reduces the Town Hall side by $796k. Applying all this math gets it down to these totals for bond votes. Total Bonds - $9.55 million. The above shows how the Board could get there for a Bond package that has a chance of passing. However, under no circumstances should showing how this could be structured be equated with support. This still has to be paid for somehow, and the Town has shown little in the way of fiscal restraint to get there without significant tax increases. Examples of where the money can be found will have to wait for another time. DAVIDSON, N.C. – The Town of Davidson is now accepting applications from nonprofits for grant funding for the 2018-2019 fiscal year. 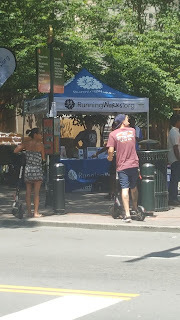 Please go to www.townofdavidson.org/nonprofitfunding for more information and to apply. The application deadline is July 31. - Nonprofit agencies must meet a public purpose that the town government does not directly provide, but could if facilities and staffing were available. The nonprofit agency must be experienced in delivering that service. 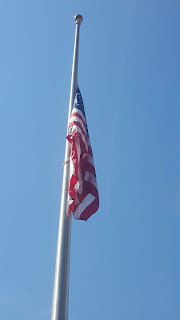 - Nonprofit agencies must have 501(c) 3 status, a volunteer board of directors, and must provide to the town appropriate accounting measures, in compliance with the Local Government Budget and Fiscal Control Act, to ensure accountability. - The number of agencies funded can change each year and there is no limit on the number of agencies that can qualify and apply. 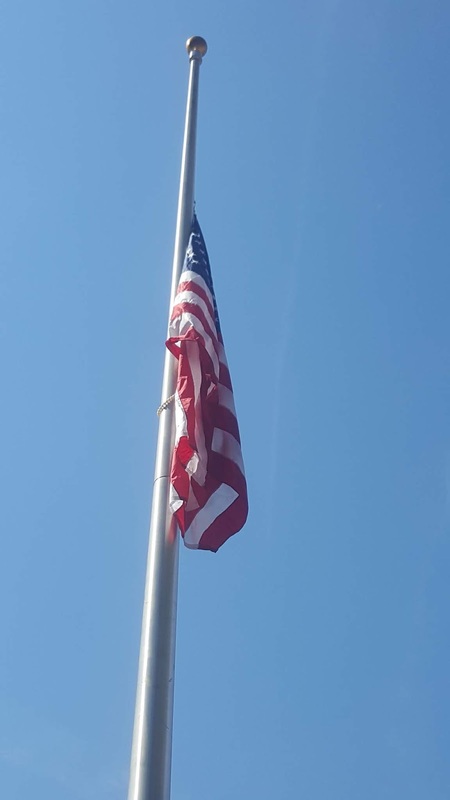 For more information, please contact Town Clerk Betsy Shores at bshores@townofdavidson.org or 704-940-9614. DAVIDSON, N.C. – The Arts & Science Council (ASC) seeks two Davidson citizens for its advisory council to represent the north/west region of Mecklenburg County. The ASC strives to create a more vibrant cultural life for our entire community. To accomplish this goal, the ASC board of directors has established advisory councils to ensure that the ASC is actively engaged in assessing community and resident needs. In addition to two citizens from Davidson, this council will include nine members from other parts of Mecklenburg County. The advisory council will meet twice annually as a council and once a year with the ASC board of directors at their annual meeting. Please return the application to Town Clerk Betsy Shores at bshores@townofdavidson.org. Questions about the advisory council should be directed to Executive Director Robert Bush at robert.bush@artsandscience.org. For more information about the ASC, please visit www.artsandscience.org. DAVIDSON, N.C. – Starting on July 1, the Town of Davidson will use contractor Waste Pro, based in Concord, NC, to collect garbage, recycling, and yard waste. There will be no changes to the routes or carts. They will operate on the 4th of July, so please set out your trash and recycling cart on Wednesday, July 4, if that is your typical collection day. If you have any questions about garbage and recycling, please visit www.townofdavidson.org/GarbageSchedule. On this page you will be able to submit a request (i.e., a new cart) or make a complaint (i.e. pick-up was missed). For more information, please contact Public Works and Project Manager Doug Wright at dwright@townofdavidson.org. DAVIDSON, N.C. – The Town of Davidson is excited to announce the beginning of its comprehensive plan process. With the support of the Davidson Board of Commissioners, the process will be guided by a commitment to public engagement and innovation, grounded in the town’s core values emphasizing its traditional character, village-based identity and sense of community, and commitment to achieving a high quality of life for all residents. A full range of stakeholders encompassing the town’s citizens, advisory boards, staff, and community stakeholders such as Davidson College, local schools, nonprofits, businesses, neighborhood representatives, and religious institutions will contribute to this effort. What is a comprehensive plan? It’s the leading policy document and tool to help communities create a vision and guiding principles for decision-making for their town. In Davidson’s case, it allows our community to understand our historical context, acknowledge immediate concerns, evaluate options for how to best proceed, and move together toward a better future for Davidson. It’s a community-centered process – input from our citizens is critical. The Davidson Board of Commissioners created a committee of elected officials, advisory board members, citizens, and staff to create a request for proposals document and select a consultant to help our town with the comprehensive plan. The committee is in the process of receiving proposals from consultants. Once a consultant is selected and hired (likely in August), we will announce the citizen engagement opportunities for the fall. 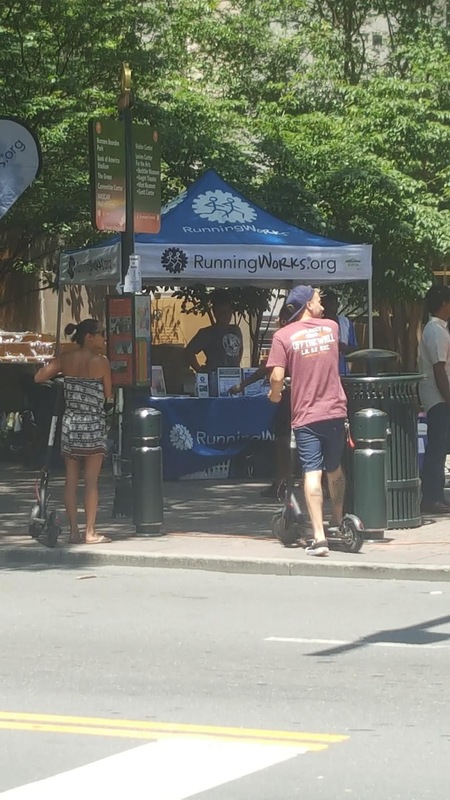 For more information, including FAQs, please visit our website at www.townofdavidson.org/ComprehensivePlan2018. 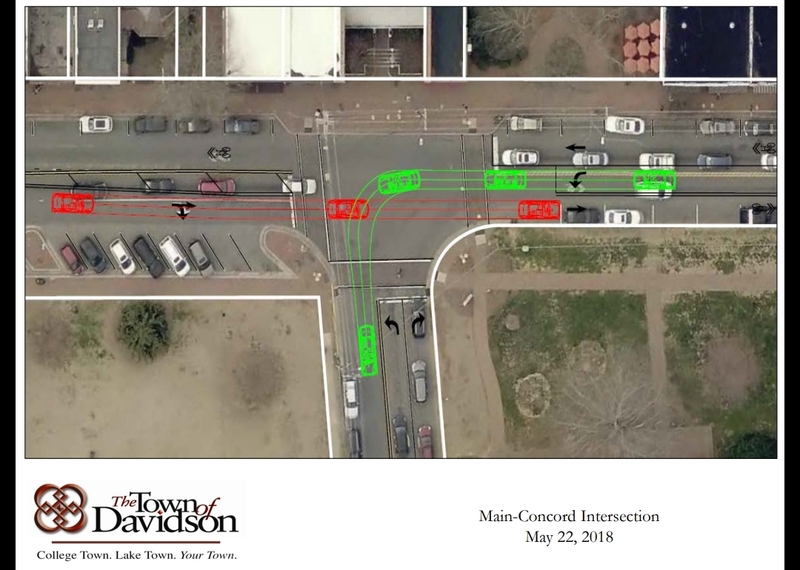 Tuesday night's Board meeting provided more information on what could happen at the Main Street/Davidson-Concord Road intersection in downtown Davidson as Commissioners heard an update on what Town Staff has been doing with the idea. Prior to the meeting it was made clear that no vote would be taken, and when the discussion ended it was clear one is not imminent. Soon after the open comment section of the meeting ended where several citizens spoke against the idea of removing 10 parking spaces to accommodate a left turn from southbound Main, Public Works Director, Doug Wright, gave a presentation that clarified a few points. The College has not been involved in the current discussions. Staff was studying what could be done in the existing right of way. A less intrusive plan would require some land donation from the College to maintain those spots. This would also require utilities to be moved. Staff will be looking into this going forward. The plan as proposed eliminates the dedicated right turn lane off of northbound Main St. Wright indicated that analysis was completed showing this would not just move the problem from one side of the intersection to the other because drivers have more options to make a right at streets such as Chairman Blake and Walut St prior to the intersection. This intersection has been designated as "needs improvement" in the Mobility Plan currently underway. Modeling has been completed showing that this intersection will remain bad in the future, but the addition of a southbound left "moves the needle" in the right direction. In the comments that followed the presentation, Commissioners made several observations. 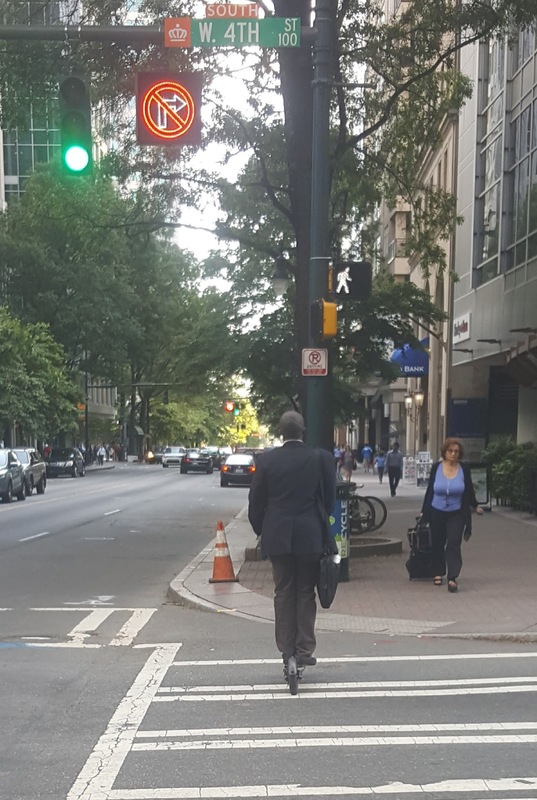 Commissioner Campbell focused on questions of pedestrian safety with widening the crossing. 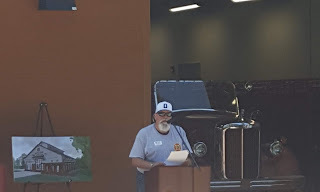 Commissioner Fort pointed out that other needed road changes underway such as Potts-Sloan-Beaty and the new connection off of June Washam aren't popular in those impacted parts of town. Mayor Pro Tem Fuller mentioned that the Board had received maybe 100 emails and by his admittedly unscientific assessment they were 3-1 against the plan as proposed. Commissioner Michael described the current situation as being in a "stasis of badness". There isn't an easy answer to this one. However, at least it is being studied, and the problem wasn't shoved aside like it has been in the past simply because it is hard. Who knew Davidson's award winning RAP was all about water and sewer? A marathon Davidson Board meeting kicked off Tuesday evening with speaker after speaker getting up to opine on something that wasn't on the agenda - the resolution clarifying the policy on extending water and sewer for new development. Commissioners first reviewed the draft resolution at their June 4th work session last week, and it clearly struck a nerve with some. 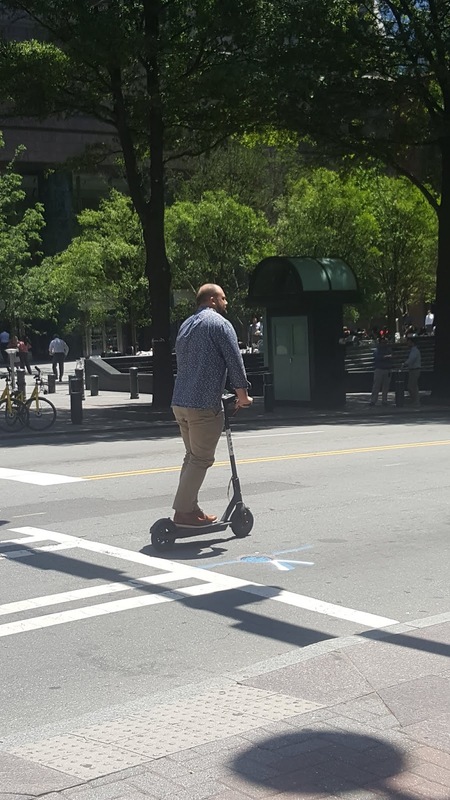 As mentioned in this story, the RAP was recently awarded an honor by the Congress for the New Urbanism for its thoroughness in implementing urban design. However, at Tuesday's meeting one would think the RAP is all about water and sewer. Speaker after speaker, primarily landowners from the ETJ, described this resolution as some sort of attack on the RAP as a whole. They looked at it as this Board somehow trying to completely take away their development rights. As stated in the Davidson Planning Ordinance, Davidson is a livable and walkable community because it chooses to rigorously manage growth. The Town of Davidson intends to permit the extension of water and sewer services so as to provide for managed growth that is in the best interests of the citizens of the Town. The Town Board shall consider water and sewer requests for developments that adhere to the requirements of the Davidson Planning Ordinance. In addition, the Board may approve or deny requests based on whether the extension is in the best interests of the community and in compliance with all the terms and conditions of the Davidson Planning Ordinance. In making that determination, the Board may consider factors such as current traffic congestion in the area of the new lines and whether construction of new lines traversing town blocks will significantly increase traffic congestion, extra costs to the Town associated with traffic control during installation, the effect of new lines on the existing natural environment, particularly the loss of trees, other health and safety concerns of citizens in the immediate vicinity of the new lines and/or development, the burden on existing infrastructure of new development which can occur at higher densities with the provision of water and sewer. 4. Applicable Areas to this Policy. The terms of this Policy shall apply to the extension of water and sewer lines to serve all vacant land, houses, buildings, and all other real property, located within the Town limits, and the Town’s extra-territorial jurisdiction not presently served with water and/or sewer. This Policy will not apply to development projects with previously established vested rights. So what does this new resolution under consideration actually do? 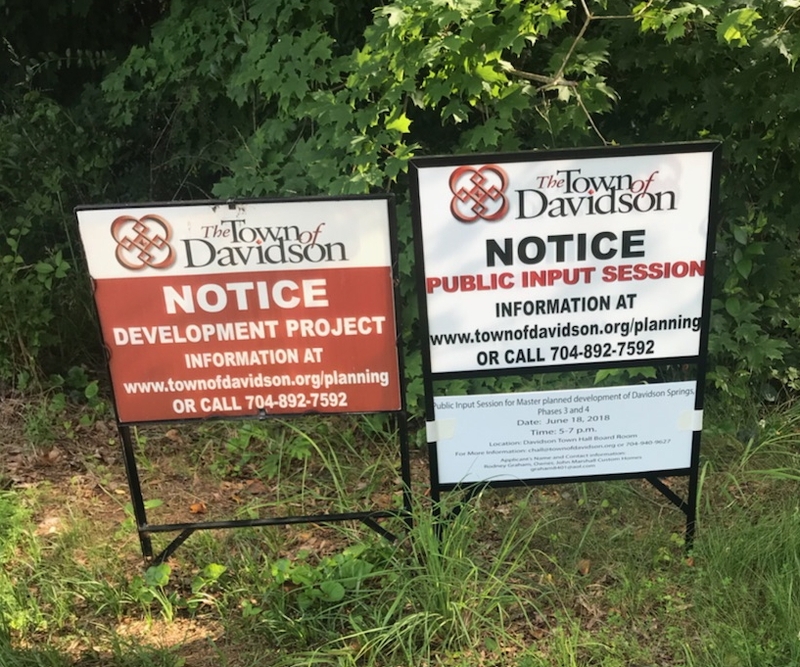 It does put the development community on notice that the Town of Davidson won't just roll over when a developer claims "by right" ability to build something under existing zoning for an area. Former Board members repeatedly misrepresented how much power "by right" actually gives developers when they rezoned large parts of the ETJ to more intensive development designations like Neighborhood Edge and Neighborhood General. One has to look no further than the proposed Potts Street development by Crescent to see this power in action. While Potts is not in the RAP it is the poster child for what can happen when an aggressive developer has access to intense by right zoning. Nobody wants to take away the development rights of land owners in the RAP areas. In fact, aShortChronicle has actually supported those rights, support for the Narrow Passage project being a prime example. The former zoning provisions prior to the RAP were impractical. For example, land owners were only allowed to build 6 houses on a parcel of land no matter how large if there was no water and sewer. At the same time, the Town would also not allow Charlotte Water to even consider water and sewer. That combination was a very effective means of taking development rights. However, even that did not totally prevent development. Narrow Passage mentioned above was approved pre-RAP through the conditional zoning process and originally was planned to use septic systems. It will now use sewer. It is a reasonably scaled project that fits in the surrounding area. Proposals like that in the future would seemingly meet the criteria outlined in the proposed resolution. Proposals that seek to pack as much density as possible into a project under the zoning granted by the former Board against fierce citizen opposition might not. Proposals that seek to implement projects that negatively impact the overall quality of life in an area should not. The policy proposal being discussed by the Board does not eliminate water and sewer in the RAP. It does place the authority for approving those extensions anywhere in town with the Board of Commissioners - right where it should be. The Davidson Police Department invites families with elementary age children to “Custard with a Cop” on Saturday, June 16 from 11:00 a.m. to 12:30 p.m. at Whit’s Frozen Custard located at 428 S. Main Street. Children will be able to engage with our police officers while enjoying vanilla or chocolate frozen custard. Police officers will talk with attendees about personal safety, such as how to handle strangers and crossing the street safely. They will also display a police cruiser for all to see. 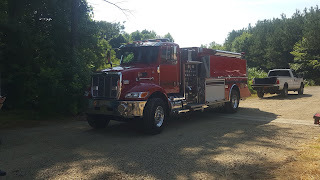 The Davidson Fire Department will also be present to display a fire truck. 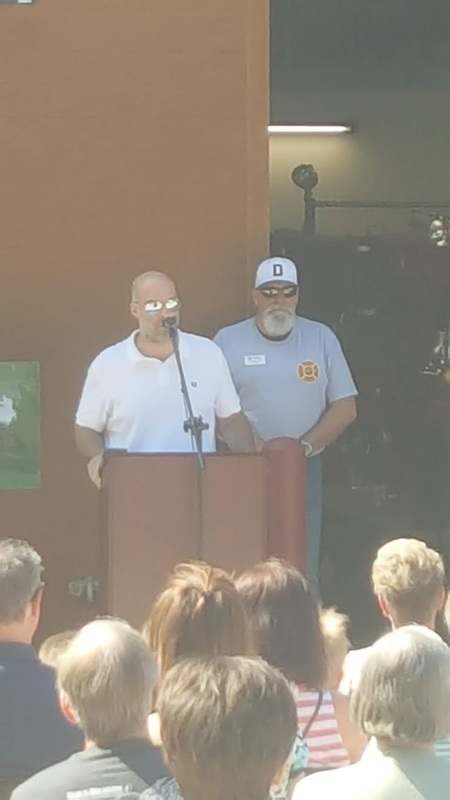 “As one of our core values states, ‘Davidson must be a safe place to live, work, and raise a family, so the town will work in partnership with the community to prevent crime and protect lives,’ so we look forward to seeing some Davidson families at this event,” said Davidson Police Officer Ramiro Better. If you have any questions, please call the Davidson Police Department at 704-892-5131. Is Davidson's budget too "conservative"? Yes! Davidson Commissioners are set to pass a budget for FY2019 on Tuesday. They pretty much have to. Per NC law, municipalities are required to have a balanced budget in place by the start of the fiscal year on July 1st - meaning this Tuesday is the last regularly scheduled meeting prior to that date since there is no 4th Tuesday Work Session in June. In order to not pass a budget on Tuesday, the Board would have to call a Special Meeting, and nobody expects that to happen. However, that doesn't mean the budget set to pass is all good. It just means the Town will have one. Changes always get made once a budget is passed. In fact, on the same agenda on Tuesday, immediately after the Board likely passes its FY2019 budget, they have another agenda item to amend it to give away subsidies up to $50,000 to local "service agencies". That additional money will come out of the Town savings account called the "fund balance". So, changes can be made once the budget is passed, and here at a aShortChronicle the strong hope is that the Town make it less conservative, much less conservative, as the fiscal year goes forward. What? "Less conservative"?!?! Did aShortChronicle really say that? Yes, yes he did. So, before some readers have a knee-jerk reaction to the use of the word conservative (it has been known to happen), let me explain. You see the word "conservative" all depends on your perspective. In this case, the Town is spending other people's money - aka taxpayer money, aka your money. So when you hear Town Staff say things like they take a conservative approach to budgeting to cover worst case scenarios, so they don't have to go back to ask the Board for more later, they call that being conservative. In practice, what that staff perspective of conservative means is that they budget way more than actually needed to cover standard operations, so they don't have to be inconvenienced by going back to the Board as often to ask for more money. Their view of the word conservative and the view of that word here at aShortChronicle are vastly different. In light of that, yes, the budget set to be approved on Tuesday is too conservative - using the Town's upside down definition of the word. 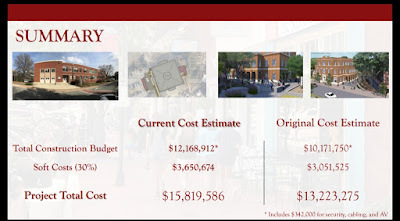 aShortChronicle did some analysis on the budget data made available by the Town. Here is what was found, but first, a bit about how these budgets are put together. First, they must balance. The Town can't spend more than it is projected to take in via its various revenue (aka tax dollar) streams or from debt or from draws on fund balance. Second, the Town funds operations on an ongoing basis from its regular revenue streams and also has various one time capital expenses. Capital expenses are typically pulled from the fund balance. Third, there are several sections to the budget, the general fund is the largest portion and also where the Town has the most discretion. There are other portions like solid waste and road funding that have dedicated funding where by law the money has to be spent on those items. For this discussion, aShortChronicle is focusing on the general fund. Finally, a budget is just an initial plan. As the year goes forward, actual expenses go against that budget, and if these actual expenses are less than the budget, then there is a surplus. What happens with any surplus? It gets reallocated to other areas, or it goes into fund balance. People need to remember, that surplus is taxpayer money loaned to the Town interest free. So, how did the Town do in the current FY2018 when it comes to this "surplus" from an operations perspective? Well, they had a lot of it. Look at the 3rd column of numbers labeled "Unspent % FY2018 Budget. You'll see all departments had a surplus except for Fire and Grounds. These departments also had big capital expenditure additions to their budget during the year. If you take those out, these departments also had surpluses. That's what is shown in the 4th and 5th columns of numbers. The 4th column is effectively the actual operations spend by department. The 5th column compares this to the budget as a percentage. The last column is a proposed budget for FY2019 that does 2 things. First, it fully funds Police and Fire at their FY2019 request. Police and Fire are the Town's number one responsibility. Both departments are in a growth phase and need the additional resources. The main improvement needed in budgeting here is a more accurate estimates for when personnel will start. As of now, the understanding is that new Town personnel are included in the budget for the entire year regardless of when they actually start. This apparently is true for all departments, not just public safety. That means you guarantee an underburn of dollars right from the start if someone doesn't start o July 1st. Again, the understanding is that this accounted for a significant portion of the underburn in the police department in the current fiscal year. Second, the proposed budget from aShortChronicle gives all other departments 3% more than they spent in actuals in FY2018. To get the Ops budget for Grounds subtract out the $925k capital expense added to that budget in FY2018. Under the proposed budget from aShortChronicle, no department would take a cut from what they actually spent in FY2018. 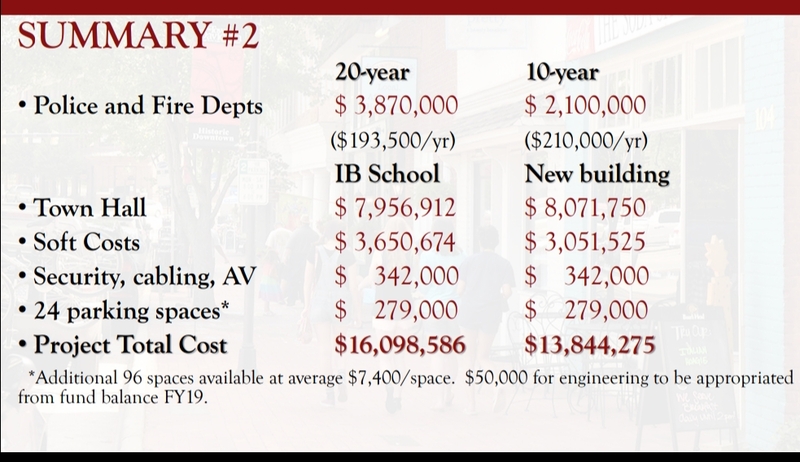 Here is what that would result in when compared to the Town Staff's proposed budget for the upcoming year. Start with the Town "Proposed Budget". Subtract out the $1 million for Continuum and the $400k staff "carved" into the budget for capital expenses. That leaves an "Ops Budget". Compare that to the budget from aShortChronicle using the methodology described above. That means there is likely over $1 million of "excess" in the Town Staff budget. That is almost exactly 10% of fat in the budget when compared to last year's actuals and after fully funding police and fire and giving all other departments a 3% increase in spending. So, is the Town budget too "conservative"? What do you think? 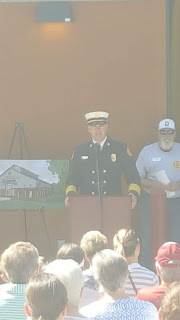 At the groundbreaking back in October 2016, DFD Chief Bo Fitzgerald said in his remarks "if you are having the worst day of your life, by the time you hang up the phone we want you to hear sirens coming." On Saturday, achieving that goal came a lot closer with the opening of DFD Fire Station #2 on Davidson-Concord Road next to the Beaver Dam House. 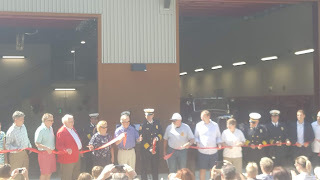 Opening this facility has been a long standing goal for the Town which has been delayed due primarily because of financial reasons from Mi-Connection subsidies and the economic downturn from the Great Recession. The project also suffered multiple weather related delays after construction commenced, opening nearly a year after originally planned. However, Saturday morning brought a very happy occasion with current and former elected officials on hand as well as a large number of citizens to see the ribbon cutting of the newest addition to the town. Enjoy the photos of the event. 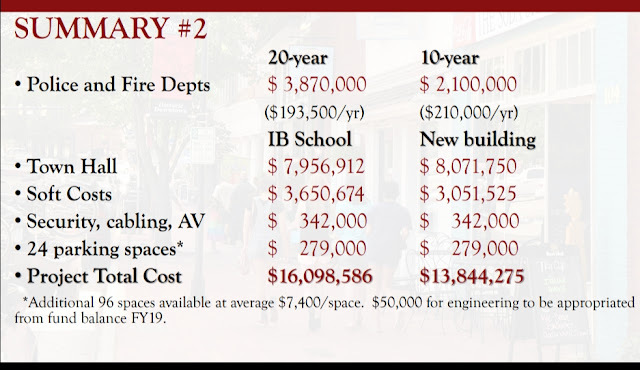 The hope for taxpayers with the CMS IB building conversion was that it would cost significantly less. Those hopes will likely be dashed on Tuesday when the Board hears an update on the project per the agenda posted on Friday. Back in August 2017, the old Board decided to go forward with a $13.2 million set of projects. When the Board hears an update on Tuesday on the alternate plan, the numbers will actually be MORE. To be fair, the two plans are not apples to apples. 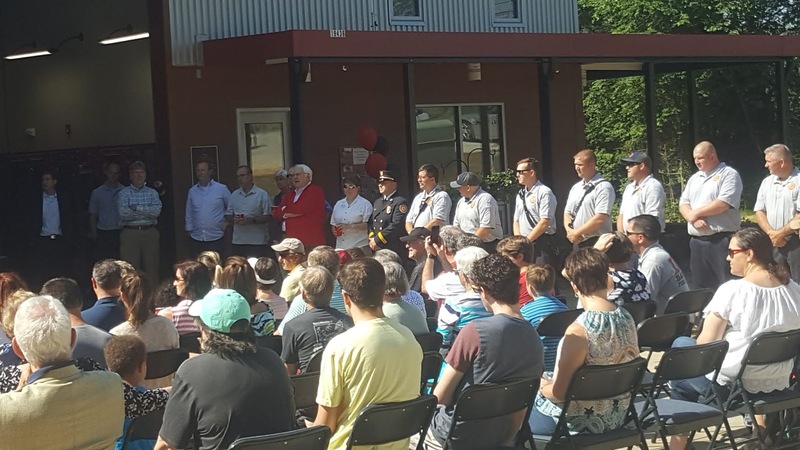 The new plan includes $1.77 million more for the renovations to the existing Town Hall for public safety expansion to bring it up to a 20 year plan. The old Board approved a 10 yr plan for public the safety improvements, but would have financed it over 20 years. Financing a 10 year plan for 20 years doesn't make economic sense. Still when accommodating that, the new plan is about $800,000 more than the old plan. Also, the number for the IB renovation does not include renovations to the gym on the property. That facility was one of the big draws to this option. The Board has a vert tight timeline to decide what to do here if they are going to get this on the ballot for this year. It will be interesting to see what they do on Tuesday. As reported a couple weeks ago, Superior Court Judge William Bell granted plaintiffs motions regarding procedural issues in the Griffith Street Hotel rezoning process. While there is not an update on that story, the outcome of that ruling appears to already be paying dividends when it comes to transparency in Davidson. The Town sent out the below press release Thursday announcing a second public information session on the Davidson Springs project being developed by former Commissioner Rodney Graham's firm, John Marshall Homes. Monday, June 18, 5:00 to 7:00 p.m.
DAVIDSON, N.C – Citizens are invited to a public input session on phases 3 and 4 of the Davidson Springs development adjacent to Walnut Street and James Alexander Way led by developer John Marshall Custom Homes. 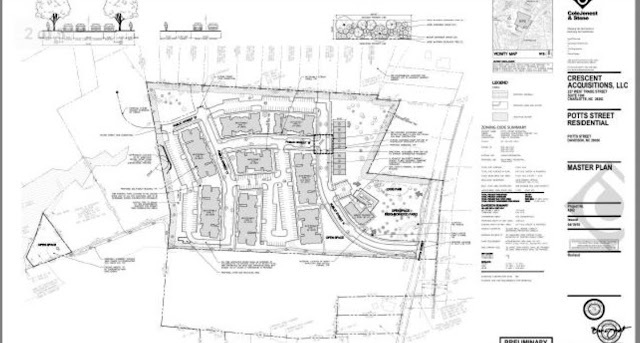 The developer is planning to build eight single-family homes and eight townhomes. The public information session will be held on Monday, June 18 from 5:00 and 7:00 p.m. in the Davidson Town Hall board room. All citizens are invited to attend. aShortChronicle followed up with Christina Shaul, the Town Public Information Officer, as to why a second PIS was happening when the original was just done in April. The response was "I believe their plan has been tweaked a little bit since the previous input session, so they wanted to share the latest plan." What's also different about this second PIS is the signage giving public notice. Take a look at the below picture. These are the signs on the Walnut Street side of the project. The 2nd white sign has the information required for these public information sessions allowing the citizenry to know what is actually going on with a project. Not having this sign with this information was one of the violations of the Davidson Planning Ordinance (DPO) that the plaintiffs won in the Griffith Street Hotel lawsuit. Having watched these development projects over the years, these white notice signs have not been in use. 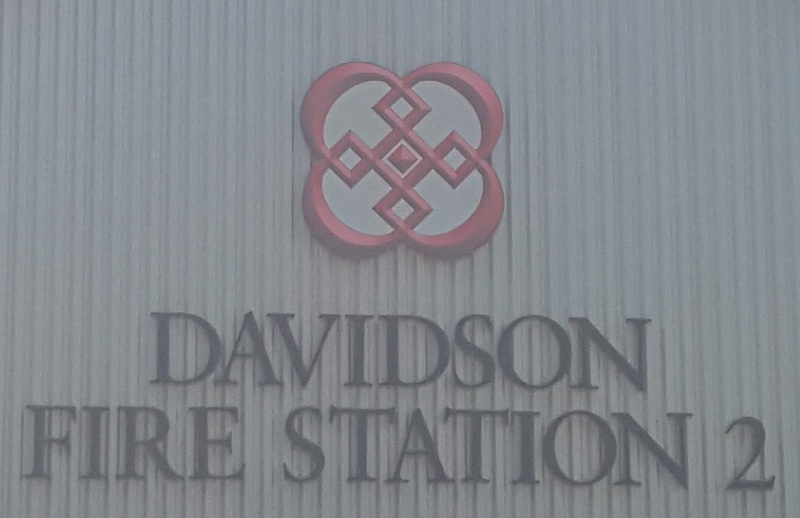 While it is good a second PIS is being held on the Davidson Springs project because the plan was "tweaked", one has to wonder if the real reason is that the first one was invalid because it didn't have this signage - just like the Hotel project didn't. If you were to ask the court, the answer certainly would be "yes". Little by slow, citizens can take back their government and make it follow the rules. These signs are one small example of that. Update: Saturday 6/9 - The published agenda for 6/12 now says there will be no vote on this subject at that meeting. Residents of North Mecklenburg are familiar with NC73. It is the primary east-west connection through the area. What many may not know is that the current alignment was not always where it is today - not by a long shot. 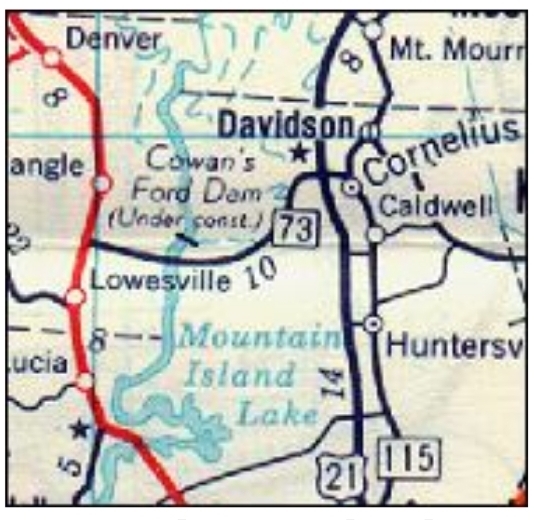 Way way back in the 20th century, NC 73 went through Davidson - right up Main Street. 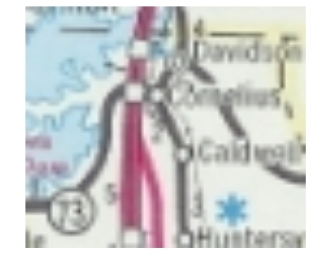 In 1979, NC 73 was rerouted at Cornelius to follow NC 115 south to Caldwell, then east as an upgrade to SR 2433 back to the initial NC 73 routing near Cabarrus County. 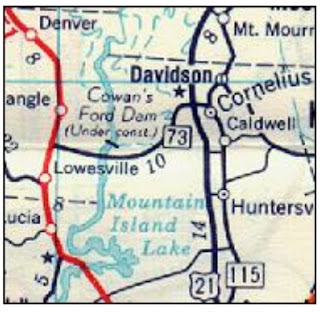 The old route had followed NC 115 north to Davidson, then southeast on Davidson-Concord Rd. Between 1980-82, Official Maps imply NC 73 was rerouted to avoid NC 115 altogether by extendeing NC 73 west over new routing to US 21, then north to NC 73 at its interchange with I-77. See these old maps from that same website. aShortChronicle checked with one long-time Davidson resident who is familiar with local road projects over the years. This person relayed that when the change occurred in the late 1970s, Davidson's Main Street went from "a busy highway to almost zero traffic overnight." This person also relayed that there was at one time humorous photo floating around showing a dog asleep in the road right in the intersection. Now, a few decades pass and once again the intersection is busy. On any given day significant backups occur on Main Street, particularly in the southbound direction. This backup occurs due to traffic volume and the lack of a left turn lane from Main onto Davidson-Concord Rd. aShortChronicle has been told that in years past traffic flowed a bit better through the intersection because southbound through traffic could sometimes squeeze by on the right if someone was stopped waiting to make a left. The ability to do that however came to a halt when he Town put the "bump outs" there to make way for on street parking. Now, traffic backs up regularly, and as growth on the east side of town continues (600+ homes at Westbranch and Davidson East) it is only going to to get worse. In response, the Town of Davidson Public Works department and NCDOT have come up with a plan to install a left-turn lane in southbound Main St that will cost $220,000 and roughly 10 parking spaces on the east side of Main. The proposal depicted below turns a portion of the existing northbound lane at the intersection into a southbound turn lane, and the parking spaces become the northbound lane through the intersection. The Town Board is set to vote on the idea at its June 12th meeting next week. However, not everyone in the community thinks the plan is a good idea, and in parking constrained Davidson, losing those 10 spaces is causing more swirl than the actual cost of the project. aShortChronicle has learned via an email that landed on Wednesday that Davidson College Presbyterian Church (DCPC) is encouraging its members to contact the Town Board opposing the vote. In the email with subject line "CALL TO ACTION, LOSING PARKING" the email encourages church members to contact the Board and ask them to "DEFER A RUSHED JUDGEMENT" (all caps in the original). 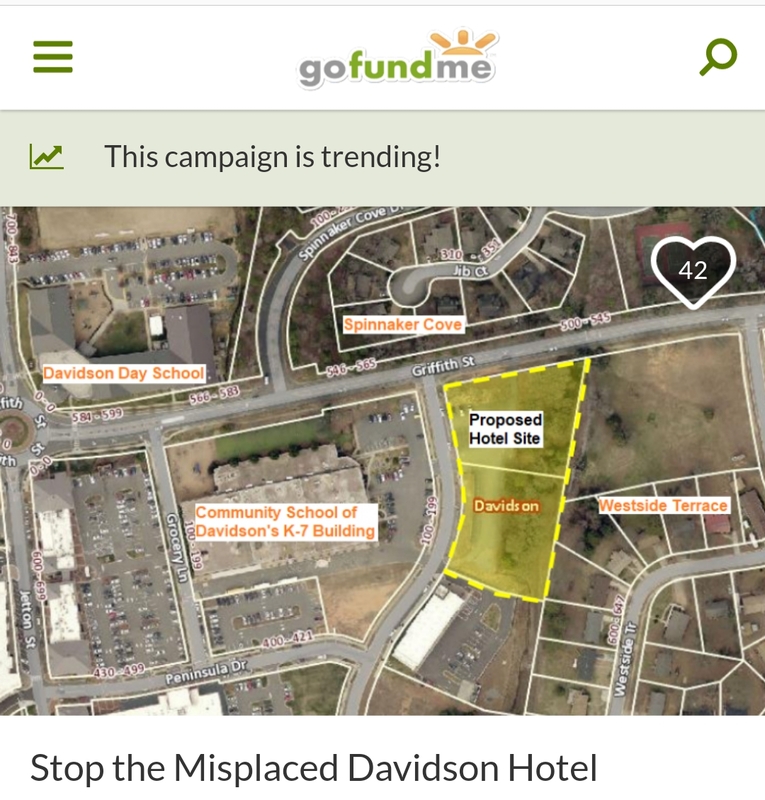 So while it certainly is interesting to see a tax exempt entity like DCPC jumping into the political fray over parking, there is a simple solution to this - Davidson College could simply donate a bit of land to retain the parking used by Davidson College Presbyterian Church. 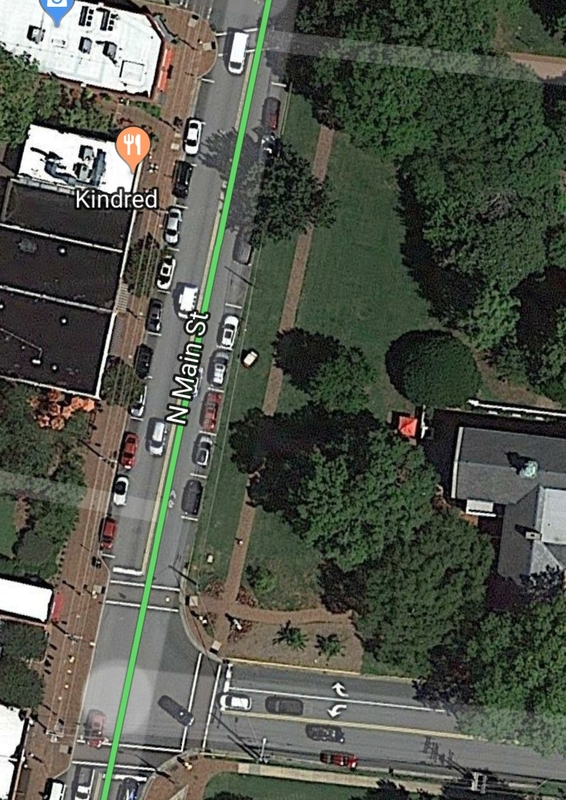 The below aerial photo from Google Maps shows that at least 7 of the 10 spots in question (the ones across the street from Kindred) could be saved without cutting down a single tree if that was done. Progress and development are going to happen in a growing region like this and many projects deserve to be fought tooth and nail to preserve the quality of like here in Davidson. Here at aShortChronicle fighting those fights is often what drives the content of this blog. However, this project is not one of those times. Instead, the Board should be encouraged to improve this intersection as planned working with the College if possible to preserve as much parking as possible. Long-term it is the right thing to do. Since the Board is likely getting flooded with requests to not improve this intersection, please take the opportunity to contact them if you believe they should. The entir Board can be reached at Board@townofdavidson.org. 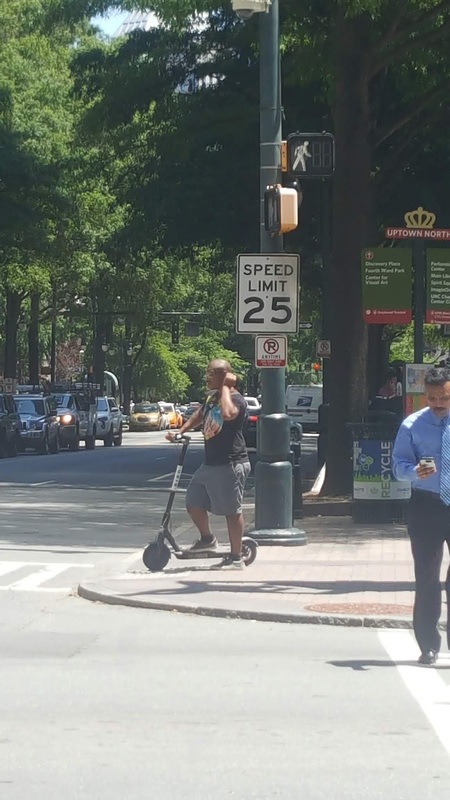 Not unlike the Birds in the Hitchcock movie, BIRD electric scooters are flocking to Uptown Charlotte in recent weeks, and as somewhat of a surprise to aShortChronicle, they are popular - very popular. 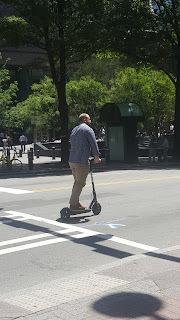 Take a step out of your office building in the Trade/Tryon area and you will see people, mostly Millenials but certainly not all, zipping around on the newest entrants on the Charlotte alternative transportation scene. These electric scooters seem to be taking over as a more popular option than the dockless bikeshare units that flooded Uptown earlier this year. They are also considerably more expensive at $1 to unlock and $0.15 per minute after. 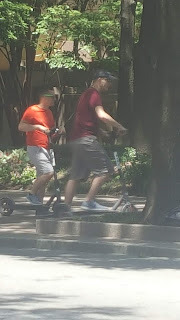 Here are few pics of these scooters in use. This last one was the best. Check out the dry cleaning! 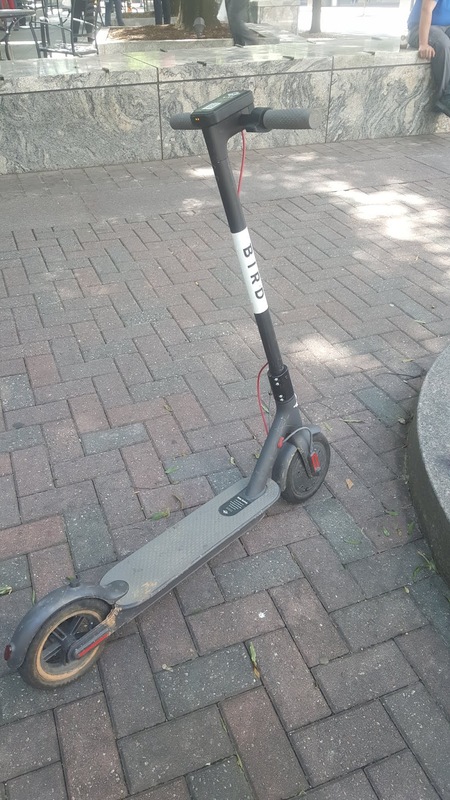 This rider was asked if he used it often even though they were kind of expensive. 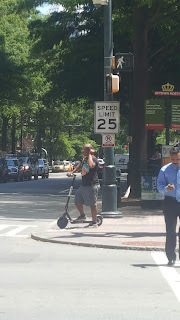 His response before speeding off was that it was cheaper than a lightrail ticket. If your head hurt during the Town of Davidson Board of Commissioners meeting last night, you are not alone. Many citizens felt like they had just left a four-hour SAT test after staff and commissioners discussed the watershed text amendments and water/sewer. 1. If “the county” asked for the watershed text amendments, why have staff neglected to invite “the county” to come address the controversial topic? 2. Why are the text amendments being used for zoning rather than water quality? 3. If the goal is to address water quality, why is the planning department asking for big changes for single-family built upon area (BUA) in the critical watershed, but not for high-density developments? 4. Can the town send a text amendment notification postcard to every homeowner in the critical watershed? 5. Why can’t the Board of Commissioners approve/deny density averaging rather than the Board of Adjustment? 6. What is the current policy and process for voluntary annexation? 7. What is the current policy and process for water/sewer approval? 8. Why is there no written documentation or criteria for either of these processes? The watershed text amendment discussion ended in a percentage soup. Can we build 24%? 34%? 46%? It became crystal clear that the subject is not ready for a board vote on June 12th. Commissioners expressed intent to seek public input on the annexation/water/sewer process. The current, undocumented practice allows the Town Manager to approve water/sewer, but the commissioners are seeking to change this practice. They would like to see formal criteria and written documentation. Plan your three-minute public comment for Tuesday, June 12th, at 6 pm. 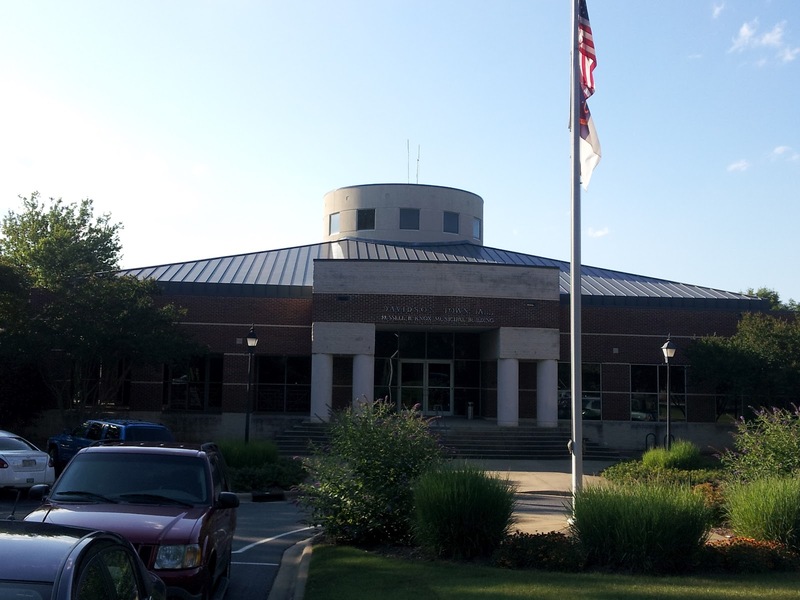 Typically, the 1st Tuesday meetings for Davidson's Board of Commissioners is not very packed, but the June meeting set for this week has some important topics. The controversial Watershed Ordinance rewrite will be on the agenda again. The Board of Commissioners will hold a joint work session with the Planning Board to discuss this topic. See here. A resolution on Board approval for Water and Sewer extension will be discussed. Readers will remember the former Board approved water and sewer extension in concept for the ETJ, and these projects are now on the CMUD capital improvement plan. See here. There are also discussion items regarding the Planning Department's priorities and the Parking Study completed a couple years ago. See here and here for those. 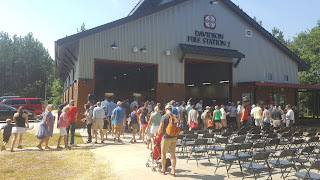 DAVIDSON, N.C. – Community members are invited to the grand opening ceremony for Davidson Fire Station 2, located at 19436 Davidson-Concord Road on June 9 from 10:00 a.m. to 1:00 p.m. 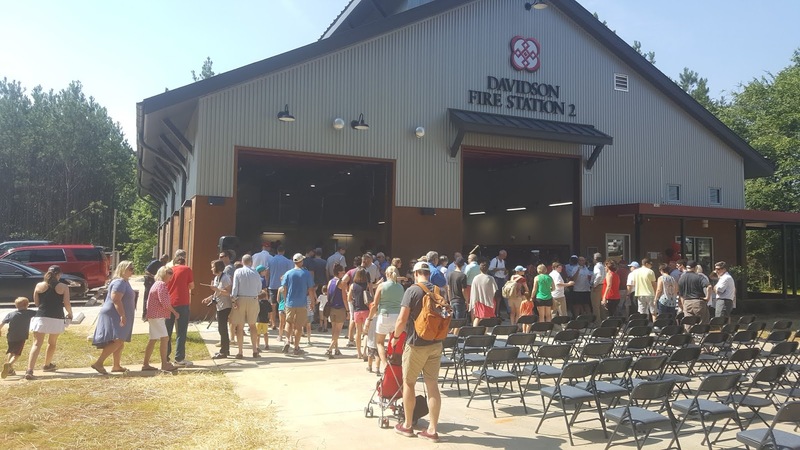 This station will serve the eastern portions of the Davidson/North Star Fire District, improving response times to this area. Fire Station 2 will house an engine company staffed with four firefighters who are also certified Emergency Medical Technicians. Please join us at 10:00 a.m. for a short ribbon-cutting ceremony. 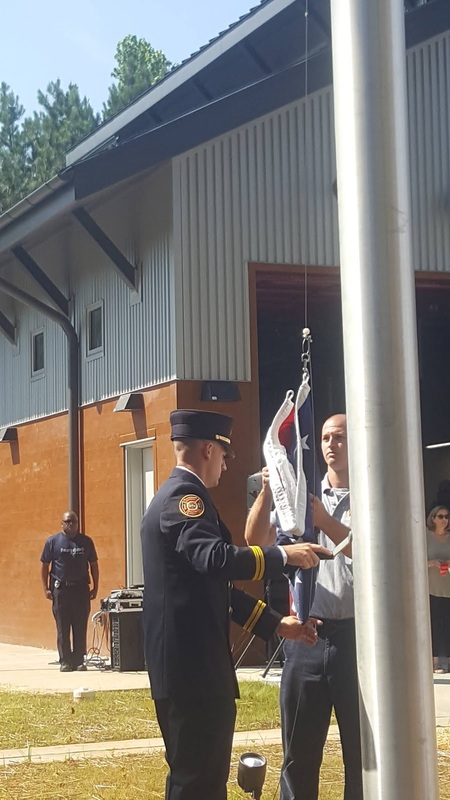 Following the ceremony will be station tours, demonstrations of fire apparatus, food, and frozen custard until 1:00 p.m. At 11:00 a.m., fire fighters will host a story time for children. We hope you’ll join us for the festivities. 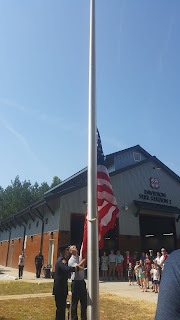 1.Park at Historic Beaver Dam (19600 Davidson-Concord Road) and walk through the grass to the new fire station to avoid traffic. 2. Park at the River Run athletic field (19000 Davidson-Concord Road), cross Davidson-Concord Road at the intersection of Robert Walker Drive, walk down the new side path along Davidson-Concord Road, and wait for the Davidson Police Officer to stop traffic in front of the new station for a safe crossing. Construction on this station began in November 2016. 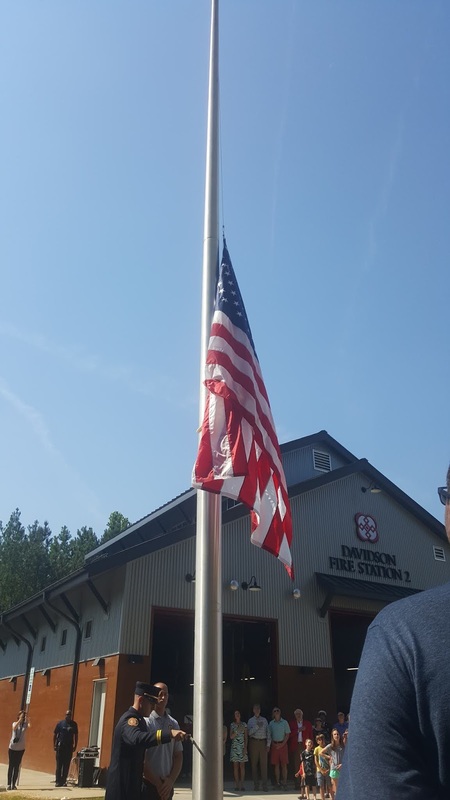 Until now, the town contracted with the Odell Volunteer Fire Department in Cabarrus County to provide first responder service to the eastern part of our jurisdiction. 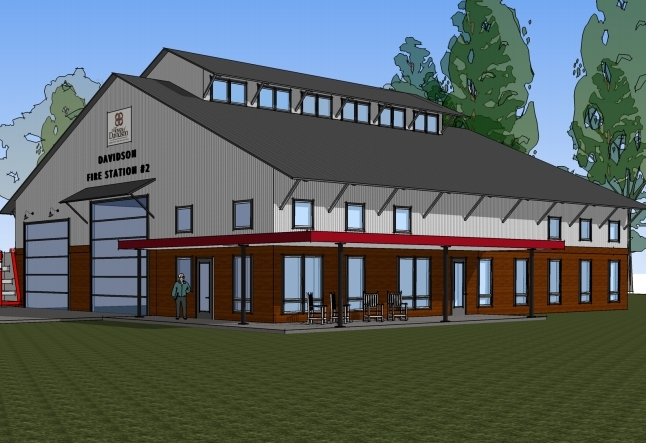 The projected final cost for this new fire station is $2.2M. The Davidson Board of Commissioners approved the financing arrangement at their October 11, 2016 meeting to finance the bulk of the cost over 15 years. “This new fire station will help us serve our growing community – the fire fighters in this station will be the first responders for medical and fire emergencies in the eastern part of our jurisdiction,” said Davidson Fire Chief Bo Fitzgerald. Details on the new fire station, including a site plan, floor plan, and renderings can be found here: http://www.townofdavidson.org/1062/Davidson-Fire-Station-2. 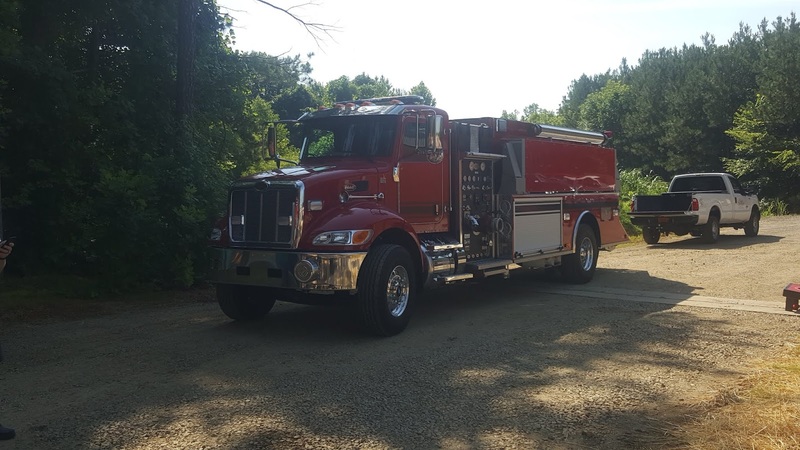 For more information about this process, please call the Davidson Fire Department at 704-940-9623. DAVIDSON, NC --The Continuum (formerly known as MI-Connection) Board of Directors met Thursday, May 17 at Davidson Town Hall to present their FY 2018-2019 budget and share their third quarter 2017-2018 results. Continuum’s budget year begins July 1, 2018 and runs through June 30, 2019. The meeting began with a public hearing regarding the proposed FY 2018-2019 budget. CEO David Auger presented the budget, which shows continuing growth: total revenue is projected at $22,011,453, and cost of goods sold is projected at $8,817,724, yielding a gross profit of $13,193,729 or 60%. Total operating expenses are projected at $5,876,596 and EBIDA (earnings before interest, depreciation and amortization, a key metric used by cable operators to measure performance) is projected at $6,047,000. A total of $6,413,690 will go toward paying debt service. The subsidy to Continuum by the Towns of Davidson and Mooresville is projected at $2,936,690 with the remainder funded by Continuum’s free cash flow. The Town of Davidson will contribute $1 million based on our most recent interlocal agreement with Mooresville. Auger also shared third quarter FY 2017-2018 results. Revenue is up by .47% and total expenses are up 3.82% in the third quarter of FY 2017-2018 compared to the third quarter of FY 2016-2017. EBIDA is down 9.69% as compared to 2017 and overall EBIDA percentage is at 22.29%. While revenue generating units are down 1.08%, customer relationships have increased .05% in FY 2017-2019 as compared to FY 2016-2017. The Continuum Board of Directors approved the proposed FY 2017-2018 recast budget and the proposed FY 2018-2019 budget. Continuum plans to hire 12 new technical support and customer service representatives in their Mooresville headquarters. 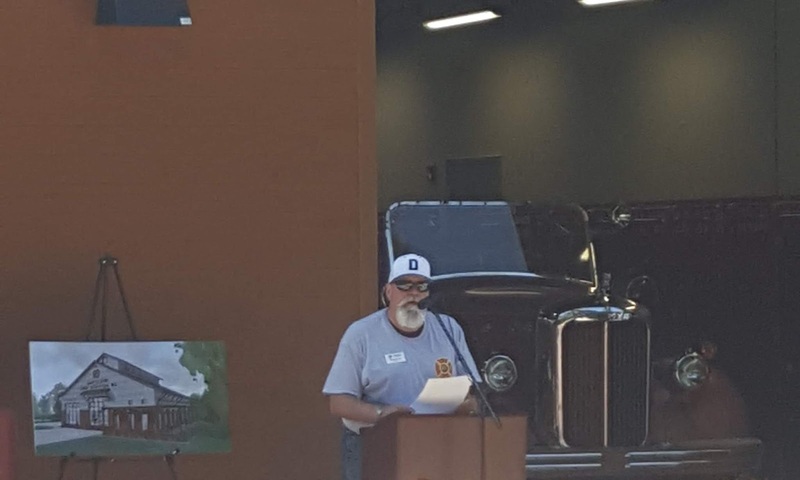 Once the new positions are filled, Auger says he will have achieved his goal of successfully transitioning the company to offering 100% local customer service and support for both residents and businesses in Mooresville, Davidson, and Cornelius. “Based on business decisions to bring all services in-house, our overall revenue is trending upward,” said Auger. For more information on Continuum and services available, please visit: www.ourcontinuum.com. 9. I think it’s a GREAT idea to have 246 apartments and nine townhouses with only one way in and out--Davidson is all about “connectivity.” I hope everyone walks through my yard to get to town. 8. I’m sure the 1,000 new “Crescent Davidson” residents will only ride bikes and walk everywhere, like Charlotte. Plus, the train is coming soon. 6. The apartment renters won’t have school-age children. Crescent said it in their marketing packet and application, so it must be true. Plus, our schools won’t be overcrowded soon--HB 514 will solve EVERYTHING. 5. We are revising our Watershed Ordinance because we care about drinking water. That’s why we want large slabs of concrete apartments and hotels next to the lake. 4. I’m sure “the county” told us to do this. 3. Who cares about the displaced Potts wildlife? The animals can just relocate to Fisher Farm. They can migrate two-by-two on the ten-foot path. It will be just like Noah’s Ark! 2. 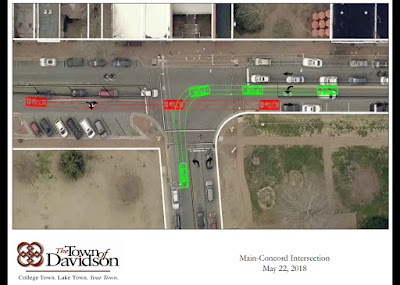 I sure am glad Davidson and Cornelius are just asking Crescent to make a payment in lieu rather than improve intersections. I love sitting on 115.